Learning an instrument is lots of fun but we know that in the early stages particularly, children need help getting into a good practising routine between lessons. 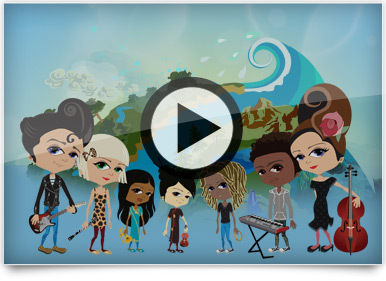 To help children make the best possible start we’ve introduced a new online programme called Charanga Music World. Right from the outset, Music World engages children in ways that are familiar to them. They create an avatar, choose their instrument and straight away enter a magical musical world of learning, practising and having fun as they learn the essential skills. It’s also a great way for parents and carers to find out how to help their children. If a child is learning with a teacher from Notts or one of the other Hub partners, you can ask them for a token which will enable you to set up a free account. Likewise, if a child is attending a school taking part in the Hub’s ‘Musical School’ programme they should ask their music teacher for a token. Children enjoy using computers and Charanga Music World makes use of these skills to provide engaging activities helping motivate them to practise more between lessons and so accelerate their learning. There are pieces with backing tracks which can be played at different tempi and with or without the tune being played with the pupil; there are graphics which can be used to show where notes are played on the instrument as they are being played; phrases can be looped; interactive resources support aural skills, simple improvising and composition. Each child can make their own avatar and can earn points and virtual “coins” along the way, as well as badges for achieving certain milestones. Whether pupils are having individual, small group or First Access whole-class teaching, Charanga Music World can support and encourage more practice between lessons. The World is a self­-contained system with no chat or social networking systems and is completely safe. The parent or guardian is contacted to arrange the log in for the pupil to use online at home. Many parents and guardians enjoy exploring the World with their children. There are regular updates and new resources added to the World. Currently Music World can be used on laptops and desktops with an internet connection. Tablet usage will appear very soon.